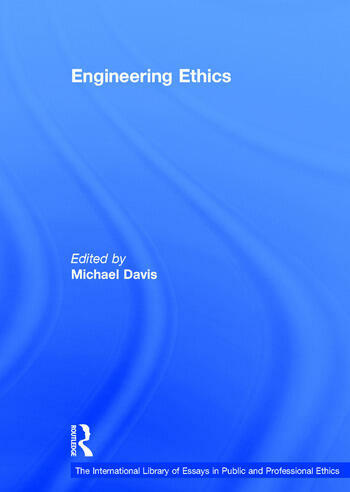 This volume is a collection of articles published since engineering ethics developed a distinct scholarly field in the late 1970s that will help define the field of engineering ethics. Among the perennial questions addressed are: What is engineering (and what is engineering ethics)? What professional responsibilities do engineers have and why? What professional autonomy can engineers have in large organizations? What is the relationship between ethics and codes of ethics and how should engineering ethics be taught? Contents: Introduction. Preliminaries: Defining 'engineer': how to do it and why it matters, Michael Davis; Are business ethics and engineering ethics members of the same family, Norman E. Bowie; Is engineering ethics just business ethics? What can empirical findings tell us?, Vivian Weil; Ethics in competitive bidding and contracting, Arthur Schwartz. Important Cases: The iron ring, Henry Petroski; The case of the 3 engineers vs. BART, G.D. Friedlander (1974); The aircraft brake scandal, Kermit Vandivier; Give Goodrich a break, John H. Fielder; Moral dilemmas in highway safety decisions, James I Taylor; The sealed beam case: engineering in the public and private interest, George P.E. Meese; What is Hamlet to McDonnell-Douglas or McDonnell-Douglas to Hamlet: DC-10?, Peter French; Representation and misrepresentation: Tufte and the Morton Thiokol engineers on the Challenger, Wade Robison, Roger Boisjoly, David Hoeker and Stefan Young; SDI: a violation of professional responsibility, David Lorge Parnas); Bhopal: an essay on moral responsibility and civic virtue, John Ladd; The bioengineer's obligation to patients, John Fielder; The 59 story crisis, Joe Morgenstern. Professional Responsibility: Ethics and the engineering profession, Morris Llewellyn Cooke; Collective and individual responsibility in engineering: some questions, John Ladd; Access to engineering services: rights and responsibilities of professionals and the public, Robert J. Baum); The public health, safety and welfare: an analysis of the social responsibility of engineers, Michael C. McFarland; Engineers who kill: professional ethics and the paramountcy of public safety, Kenneth Kipnis); Informed consent in engineering and medicine, Roland Schinzinger and Mike W. Martin; The social/professional responsibility of engineers, Deborah G. Johnson; Is idiot proof safe enough?, Louis L. Bucciarelli; Can engineers hold public interests paramount?, Taft H. Broome Jr; Thinking like an engineer: the place of a code of ethics in the practice of a profession, Michael Davis;Explaining disasters: the case for preventive ethics, Charles E. Harris. Professional Autonomy in Large Organizations: Moral blueprints, Samuel C. Florman); Ethical responsibilities of engineers in large organizations: the Pinto case, Richard T. DeGeorge; Collective responsibility and professional roles, Albert Flores and Deborah G. Johnson; Moral responsibility for engineers, Kenneth D. Alpern; Organizational loyalty, John H. Fielder; Some paradoxes of whistleblowing, Michael Davis; Personal integrity and accountability, Roger Boisjoly; Professional autonomy and organizational restraint: the case of engineers, Peter F. Meiksins and James M. Watson ; Professional autonomy: a framework for empirical research, Michael Davis; Technology and civil disobedience: why engineers have a special duty to obey the law, Eugene Schlossberger. Codes of Ethics and Professional Organization: The philosophy of codes of ethics, L.L. Fuller; Evolution of the American Society of Civil Engineers code of ethics, P. Aarne Vesilind; Codes of ethics and the moral education of engineers, Heinz Luegenbiehl; Professional action and the liabilities of professional organizations: ASME v. Hydrolevel Corp, Larry May; Role of engineering societies in controlling hazardous technology. Research and Teaching: Science- and engineering-related ethics and value studies: characteristics of an emerging field of research, Rachelle D. Hollander and Nicholas H. Steneck; Future directions in engineering ethics research: microethics, macroethics and the role of the professional societies, Joseph R. Herkert; The professional approach to engineering ethics: 5 research questions, Michael Davis; Moral issues in engineering: an engineering school instructional approach, Vivian M. Weil; Ethics as design: doing justice to ethical problems, Caroline Whitbeck; Engineering practice and engineering ethics, William T. Lynch and Ronald Kline; Ethics in the engineering curricula: topics, trends, and challenges for the future, H. Zandvoort, I. van der Poel, M. Brumsen. Application to the Concrete: 'The concrete sumo': exigent decision-making in engineering, Michael S. Pritchard; The concrete sumo, Taft H. Broome Jr (1999); Understanding 'the concrete sumo', Vivian Weil; Broome's 'concrete sumo', Michael S. Pritchard; Concrete ethics, Joseph R. Herkert; Wrestling with Broome's 'concrete sumo', Michael Davis; Reply to commentaries, Taft H. Broome Jr; Name index. Michael Davis is Professor of Philosophy and Senior Fellow in the Centre for the Study of Ethics in the Professions, at the Illinois Institute of Technology, USA.